Citizenship Classes begin at the Duncanville Library on Friday, March 10, 2017. DUNCANVILLE—If you peruse the Duncanville Library list of services, you’ll find a variety of classes on tap this month. One timely new offering is the Citizenship class. The first day of the Citizenship class is Friday, March 10, 2017 with the enrollment deadline falling on March 9, 2017. With travel bans and immigration reform conjecture at an all time high, there has never been a better time to consider such classes. President Donald Trump has signed a revised version of his travel ban executive order banning migrants from predominantly Muslim nations. The new order removes Iraqi citizens from the original travel ban at the urging of the State and Defense departments. The order comes about a month after federal judges blocked Trump’s original ban in January. The measure seeks to prohibit residents from six (originally seven) Middle Eastern and African countries. Its announcement was delayed for about a week, as the White House sought to better coordinate its activities with federal agencies. 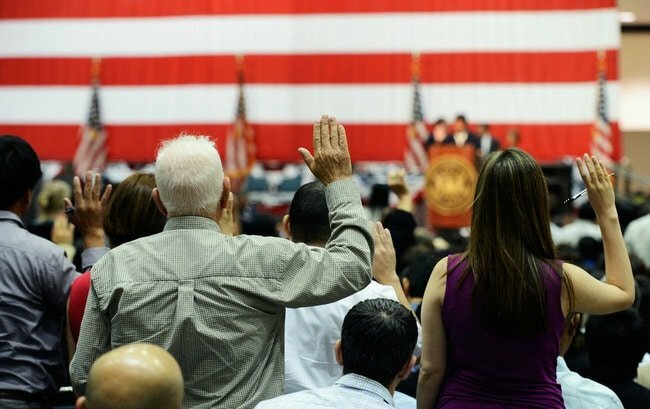 Nationwide, thousands of people have attended citizenship workshops. Many say they are taking the step because they are worried about their future in a country under new immigration measures touted by President Donald Trump. Lott says there about half a dozen signed up to take the first class. The class studies basic civics. Questions range from subjects like the balance of powers, past presidents and important historical dates. The size limit is 35 students, with one teacher teaching the class. In fact, it is the same teacher who teaches English as a Second Language [ESL] at the library. “The classes are available to anyone who would like to study for the Citizenship exam,” Lott said. The program is free of charge. Classes take place every Friday, 12-1:30 p.m., through May 5, 2017. For more information call Lott at 972-707-3875 or email her at slott@ci.duncanville.tx.us.